Based on the story of a long-forgotten civilization hidden deep inside the mighty jungle, Chilli Chilli Bang Bang by iSoftBet is a 5-reel 3-row slot machine with 20 fixed paying lines that you can play for fun or for the real money. There is a 4000-coin jackpot guarded by fearsome still cute warriors and you can collect it using the Wilds, Free Spins and the Bonus Wheel. Get some useful tips inside the Chilli Chilli Bang Bang slot review. Tired of reading? 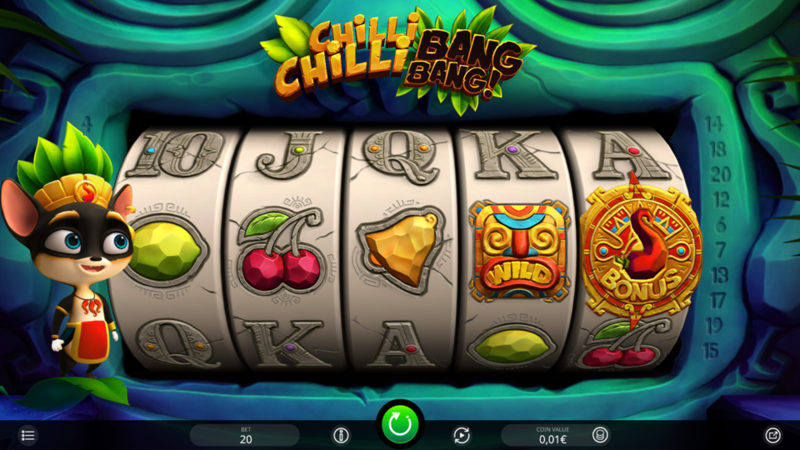 See the Chilli Chilli Bang Bang screenshots below and then claim one of the bonus offers of our recommended casinos to play for free or real! First, there’s a choice between the Chilli Chilli Bang Bang free play mode and cash wagering, so you should define it prior to making any further move. Make a combination of 3+ symbols of the same kind and receive the prize according to the paytable. The coin value goes from €0.20 to €2 making it possible to place bets between €0.20 and €20, as per your specific betting strategy. A totem-like figure is the Wild and is possible to use it as a part of a winning combination, even though it doesn’t offer any payout by default. Golden Medallion scatter is a symbol with the highest rating, so try to get it on the reels 1, 3 or 5 to activate the Chilli Chilli Bang Bang bonus round. Tips: when the scatter appears on the reels 1 and 3, the winners will get their score multiplied up to 10x. Start spinning the Bonus Wheel to receive a maximum of 20 Chilli Chilli Bang Bang free spins enhanced by one of the following randomly-activated prizes: Growing Multiplier of up to 10x, Stacked Wilds on reels 2, 3 and 4 and Wandering Wilds. Play online on the iSoftBet-powered sites free of any limits since the mobile-friendly HTML5-powered game doesn’t require a player to download the Android .apk file or the iPhone app for this purpose. 3. What is the RTP factor of Chilli Chilli Bang Bang? According to the info we got from the officials, the RTP stands at 96.12%. This is a medium to high variance slot machine that poses quite a task for landing a big win. Still, if you are persistent enough, you can largely benefit from the Bonus Wheel and multiplied winnings.